It's a Scrappy World: 12-11 Another Christmas Chaos Challenge at CtB with Bugaboo Stamps! 12-11 Another Christmas Chaos Challenge at CtB with Bugaboo Stamps! I hope that you are getting all of your holiday preparations done and enjoying this wonderful season! All of us at Bugaboo Stamps are preparing and creating in a very special way too! We hope to spread joyous goodwill by creating cards and projects to share with you during our week-long daily challenges! 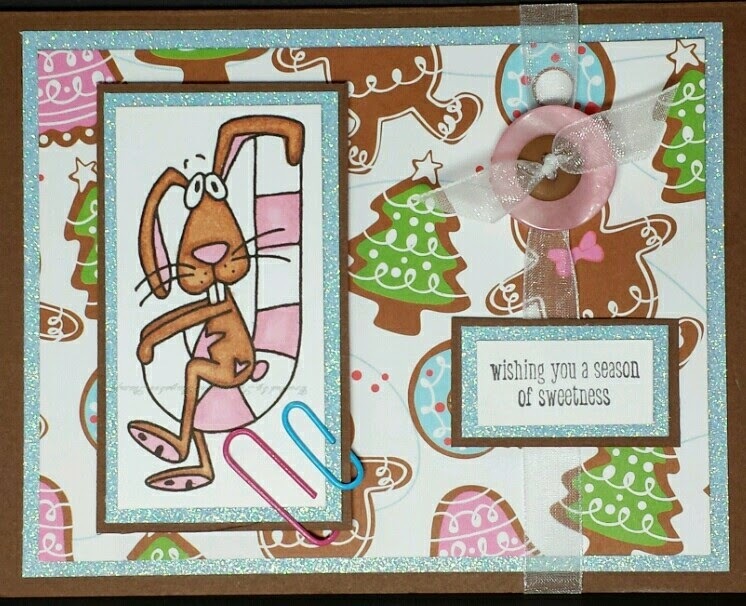 I hope you like my card below featuring Candycane Critters Rabbit. This card follows todays challenge theme of Sparkle and Shine! I'd be delighted if you left me some feedback below and played along HERE! We are all looking forward to seeing all the fabulous things that you create! Pretty and so much fun. Thank you so much for sharing your lovely creation with us at Through the Craft Room Door. So Cute! !Thanks for joining us at Holly Jolly this month!